Beat the drum louder, pipe the pipes faster. That is the way to drown out disaster. The soldiers all huddled on sand dunes. They had been fighting for days, without sleep. To end up on a beach, and wait for a boat. Shot up, bombed, and worse, with nothing to eat. 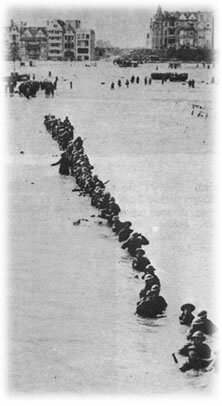 Long lines of soldiers, leading into the sea. They had paid the price of a soldier in war. Orderlies and Doctors had done their best. Struggling and screaming from their burns and wounds. Adding still more to the death and destruction. Soon to be joined by others, to voice their defiance. The fluorescent sand shone in all its brilliance. Then the boats came in and took off some more. For this was the Army’s greatest retreat. The masters in Whitehall, masters still. Their mistakes and blunders merely bad luck?. So Generals get Knighthoods, Politicians get votes. A medal for the soldiers for the hell of Dunkirk. That is the way they covered up disaster. My 11 year old boy is learning about WW2. This week’s assignment is about Dunkirk. In our googling, for facts and information, we came across your beautifully written poem. This had such a big impact on us both. It is vivid and profound giving more insight than any historical document ever could. Thank you (for your bravery in the war and for enlightening us with your poetry).